If you have an empty fish tank taking up space in your basement or garage, you could put it to use as a powerful plant propagation tool. 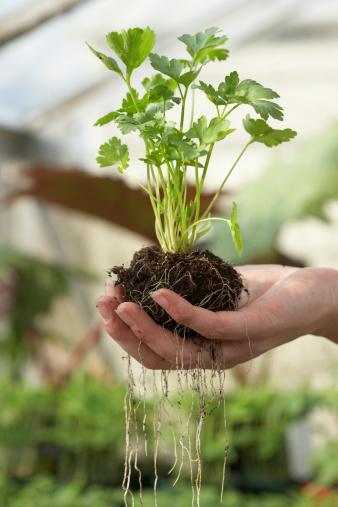 An aquarium greenhouse creates ideal conditions to to root cuttings. Not only does an aquarium create a moist growing environment, it also lets in light. Since most aquariums are set up to hold lighting elements, you can even control the amount of light your new plants receive. You can use aquarium greenhouses for a variety of indoor gardening needs, but they're best suited for propagating cuttings. Propagating allows you to take stem and leaf cuttings from your existing plants and encourage them to grow their own roots as new plants. You can also plant seeds in your indoor greenhouse and grow them into seedlings that you later transfer to in-ground or container gardens. If you're looking for something more permanent, you can create a decorative terrarium with lush, moisture-loving plants. To create an indoor greenhouse from an old fish tank, you first need to make sure your aquarium is clean. Wash it thoroughly with sop and water, then disinfect it with a rinse containing 1 tbsp bleach per gallon of water. Next you'll need to find a way to keep the moisture in. If your aquarium has a hood system with a lid that covers most of the top of the tank, it will be sufficient. What's better is to purchase either a glass tank topper from your pet store, or a piece of plexiglass cut to fit the top of your aquarium.